Desktop, Mobile, or Voice? – LogicGateOne Corp.
As with most things, the most important factor is to consider your audience. People aren’t siloed to a single device — your optimization strategy shouldn’t be, either. In today’s Whiteboard Friday, Dr. Pete soothes our fears about a multi-platform world and highlights the necessity of optimizing for a journey rather than a touch point. Another stat from the series was that 88% of people said that they used their smartphone and their TV at the same time. This isn’t shocking to you. You sit in front of the TV with your phone and you sit in front of the TV with your laptop. You might sit in front of the TV with a smart watch. These devices are being used at the same time, and we’re doing more searches and we’re using more devices. So one of these things isn’t replacing the other. This is going to get worse. This is going to get scarier for us. So look at the future. We’re going to be sitting in our car and we’re going to be listening — I still listen to CDs in the car, I know it’s kind of sad — but you’re going to be listening to satellite radio or your Wi-Fi or whatever you have coming in, and let’s say you hear a podcast or you hear an author and you go, “Oh, that person sounds interesting. I want to learn more about them.” You tell your smart watch, “Save this search. Tell me something about this author. Give me their books.” Then you go home and you go on Google Home and you pull up that search, and it says, “Oh, you know what? I’ve got a video. I can’t play that because obviously I’m a voice search device, but I can send that to Chromecast on your TV.” So you send that to your TV, and you watch that. While you’re watching the TV, you’ve got your phone out and you’re saying, “Oh, I’d kind of like to buy that.” You go to Amazon and you make that transaction. I also want to look at sort of the positive side of this. 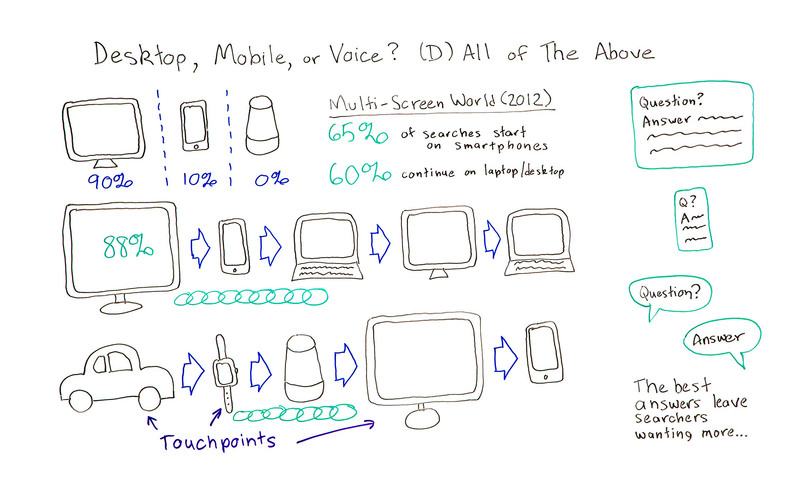 All of these devices are touch points in the journey, and they give us credibility. We found something interesting at Moz a few years ago, which was that our sale as a SaaS product on average took about three touch points. People didn’t just hit the Moz homepage, do a free trial, and then buy it. They might see a Whiteboard Friday. They might read our Beginner’s Guide. They might go to the blog. They might participate in the community. If they hit us with three touch points, they were much more likely to convert. So I think the great thing about this journey is that if you’re on all these touch points, even though to you that might seem like one search, it lends you credibility. You were there when they ran the search on that device. You were there when they tried to repeat that search on voice. The information was in that video. You’re there on that mobile search. You’re there on that desktop search. The more times they see you in that chain, the more that you seem like a credible source. So I think this can actually be good for us.